With our dynamic team of professionals, we take care of every detail of your offset printing. Because we control the whole process, from prepress to finishing, we can guarantee short delivery times and perfect quality. Haletra stands out head and shoulders above the rest of the graphics market. Our success is based on optimal service, high-quality printing and immaculate finishing. What’s more, as the customer, you are closely involved in the realisation of your print job. Our experienced professionals are there for you from start to finish and are always ready to accommodate your wishes. No wonder we take a good 9000 orders per year - and that our print work finds its way to over 1200 loyal customers in Belgium and abroad. 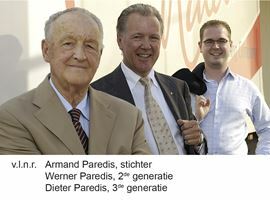 Armand Paredis founded the Haletra printing business in Helchteren in 1948. He immediately made his mark as a professional. Today the company is led by CEO Dirk Mewissen, third generation family shareholder Dieter Paredis, and Walter Dockx, Director of Production. Thanks to a consistent investment strategy the family company has enjoyed steady growth. With an ultramodern machine park and over 60 employees, Haletra has positioned itself among the top printers in the Benelux. FSC stands for Forest Stewardship Council, an independent international non-profit organisation. It was set up in 1993 by the wood sector, social movements and environmental organisations to strive for responsible forest management worldwide. At the moment FSC is the only credible and commonly recognised environmental certification system in the graphics sector. Haletra is the first printing business in Limburg to gain this certificate.